“The most amazing thing to happen was the massive personal input and huge dedication of Björn Ulvaeus,” says ABBA Museum Director Mattias Hansson. Ulvaeus, of course, is one quarter of the most famous and prolific pop group ever to come out of Scandinavia. With Benny Andersson he penned a multitude of the much-loved multi-million selling worldwide hits that became the soundtrack to a generation during the 1970s and early 1980s. But the appeal extended beyond those generations and has endured and morphed into retro cult status. One of the year’s most eagerly awaited blockbusters, The Bourne Legacy (2012), packs the same punch as the original trilogy while cleverly unveiling sinister new levels of intrigue and conspiracy. The problem facing Director/Screenwriter Tony Gilroy was how to continue the vastly popular franchise without the central character Jason Bourne as immortalised by Matt Damon. Gilroy had to create a new hero with a unique series of problems to face. In doing so he couldn’t afford to lose the essence of why audiences love Bourne and the winning formula that’s netted nearly $1billion at the box office. Dating from the 1930s and simply oozing atmosphere El Xampanyet is a taste of Barcelona as it once was. Famed for the sparkling wine from which it takes its name, this tapas bar draws in locals and tourists alike. Despite not taking bookings it's packed to the gills most evenings except Mondays when it closed. So, get there early. 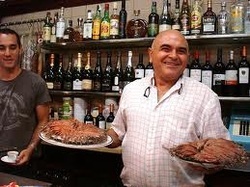 The tapas is prepared fresh daily according to availability. We suggest navajas (razor clams), boquerones (anchovies in vinegar) and cured Jabuga ham. Expect to pay £12 to £16 for a mixed tapas platter and around £7 for a bottle of Xampanyet sparkling cava. The museum could be said to have come about through accident rather then design. Museum Director Trevor White’s chance meeting with a tourist sparked the flame that would ignite the idea. Originally his concept was for a tourist greeting service. Volunteers would buy visitors either a pint or a cup of tea and give them an introduction to the city. As Curator Simon O’Connor says, “It’s what we Dubliners do all the time anyway. We wanted to find a way to tell the world about Irish hospitality and it turned into all this,” Simon adds proudly while simultaneously juggling emails, taking phone calls and conducting an interview. The buzz in the building is palpable. For over a century the French RIviera has been synonymous with both graceful motoring and fine living. The Cote d'Azur has been described as one gigantic film set and it's not hard to see why. Perhaps it's the magnificent backdrop of the Alpine foothills, or the sand-coloured medieval villages scattered across the landscape like confetti, or the shimmering bays that great you at each turn or indeed the combination of all of this. Whatever it is the Riviera oozes glamour and speaks of a bygone age when movie stars were gods and goddesses. A short ride from Dublin Airport is Dalkey, a beautiful well-heeled coastal spot mixing history with a scattering of modern celebrity. With Bono as a neighbour, no wonder they call it the Dublin Riviera. Although it's always a blast to see a bona-fide Rock Star grabbing a pint at Finnegan's Pub , it's a rare sight indeed, even for locals. If it should happen do the Dalkey thing and pretend it's perfectly normal to rub shoulders with global superstars. best described as French-Italian fusion, and watch the world go by. of a private nurse and chauffeur, bundled his wife's corpse on to the back seat of their '69 Cadillac De-ville. A fittingly surreal journey then took place with Gala Dall propped up beside her nurse on the back seat. As per her dying wishes. Gala was to return to the castle the artist had created for her in 1969 near the tiny hamlet of Pubol. The Cadillac departed the iconic Dali residence at Port Lligat, skirted Cadaques where the painter had spent his childhood summers, traversed the treacherous mountain road which links this easternmost promontory to mainland Spain, and headed north.